This is an artist's concept of asteroids delivering amino acids to Earth. The jagged white line at the bottom of the image is the actual data from the analysis of the Murchison meteorite. The two largest peaks are the amounts of right-handed and left-handed versions of the amino acid isovaline. Note that the highest of these two peaks is the amount of left-handed isovaline, revealing an excess of the left-handed variety in the meteorite. A mystery has long surrounded the "left-handed"bias in the building blocks of life. Now scientists have confirmed the sameleft-handed bias in meteorites, which may suggest that life on Earth originatedfrom space rocks. That bias exists in aminoacids, the basic components of proteins, which can come in a left-handed orright-handed configuration. Left-handed or right-handed life can only breakdown and use their respective amino acids, which means that left-handed lifecould have gained an advantage in an Earth environment with more left-handedamino acids. Researchers examined meteorites dating back more than 4.5billion years, or older than Earth's existenceas a planet, and found that meteorites with the longest exposures to waterwithin had a much stronger left-handed bias. "We don't have records on Earth, so we look tometeorites," said Daniel Glavin, an astrobiologist at NASA's Goddard SpaceFlight Center in Maryland. "They tell us a very interesting story thatthere was a left-handed bias prior to the emergence of life." 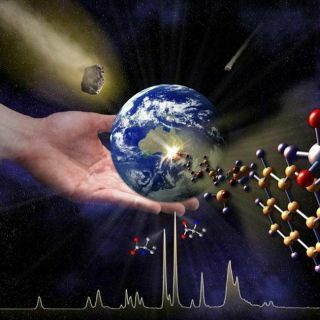 Researchers have known about a left-handedbias on Earth for years, but it first came to light for space rocks in a1997 study of the Murchison meteorite found in Australia. Since then, Glavinand another NASA Goddard astrobiologist examined six meteorites that fit intothree different classifications. Half of the meteorites showed the left-handedbias. "The two meteorites where we saw the highestleft-handed enrichment had the longest exposure to water," Glavin told SPACE.com.The evidence suggested that the meteorites had been exposed to liquid waterover time periods ranging from 1,000 to 10,000 years. Glavin added that the most pristine meteorites withlittle water exposure showed no evidence for the left-handed bias, with waterexposure being estimated based on the presence of clays and minerals. Previous lab experiments have shown that liquid water canamplify any inequality in amino acids, whether a small bias exists towardleft-handed or right-handed types — but a neutral experiment should turn up a50:50 ratio for left-handed and right-handed. Now the new research provides the first evidence ofwater's effect on amino acids in the natural world, Glavin said. Such liquidwater could have arisen within asteroids when radioactive decay heated andmelted the ice, long before the asteroids fell to Earth as meteorites. Other effects may have played a role in the left-handedbias within space rocks. For instance, polarized light from neutron stars couldhave selectively destroyed more right-handed molecules as opposed toleft-handed molecules, when the right-handed molecules absorbed more light. The polarized light may account for a percent or two ofthe imbalance, Glavin noted. But he and Dworkin found around 15 percent moreleft-handed amino acids within some meteorites. "You would have to destroy too much of the compound[with polarized light]," Glavin said. "That's why we really like theidea of water exposure." This still leaves the question of what created the smallleft-handed bias in the first place. But the confirmation of water'samplification of the imbalance within meteorites may lend more weight to thenotion that life on Earth camefrom outer space — or at least some space rock in the main asteroid beltbetween Mars and Jupiter. And that still doesn't mean right-handed life neverexisted on primitive Earth, or doesn't exist elsewhere in the universe.However, all the current evidence suggests that both Earth and the solar systemlean left. Glavin and Dworkin plan on studying even more meteorites,including samples from hundreds which have turned up in Antarctica. But theirskepticism about the left-handed bias which exists beyond Earth has vanished,after they spent several years ruling out factors such as faulty analyses orpossible contamination of the meteorites. "We just recently ran out of explanations,"Glavin said. "It's a really rock-solid case."